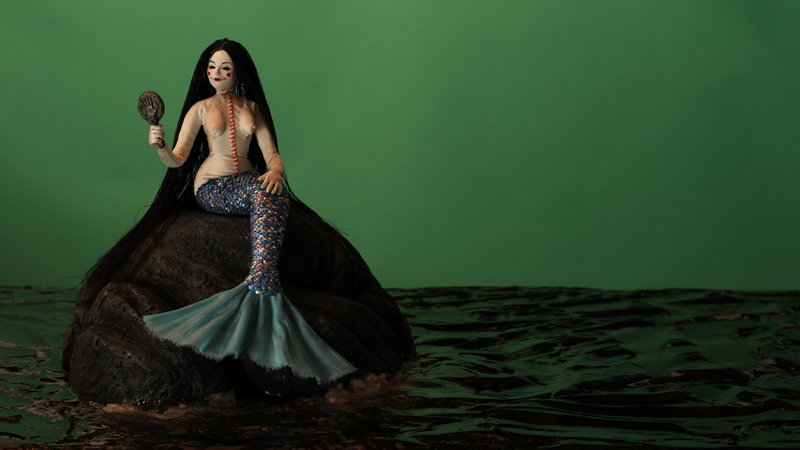 I’ve nearly finished the mermaid dream sequence. The green screen elements are all assembled in Adobe After Effects and I am at the stage of endless tinkering. Getting the subtle glow of sunrise and the perfect tilt of the stars takes time. The mermaid looking into her mirror with green screen in the background. Once I had finished sculpting the foam rock, I painted it with acrylic paint and attached it to the set with long drywall screws. The mermaid has two strong magnets in her posterior that match up with two washers screwed into her seat on the rock. Before finally getting this shot to work, I had a very bad first try. The hair gel I purchased from the Dollar Tree smelled really terrible. 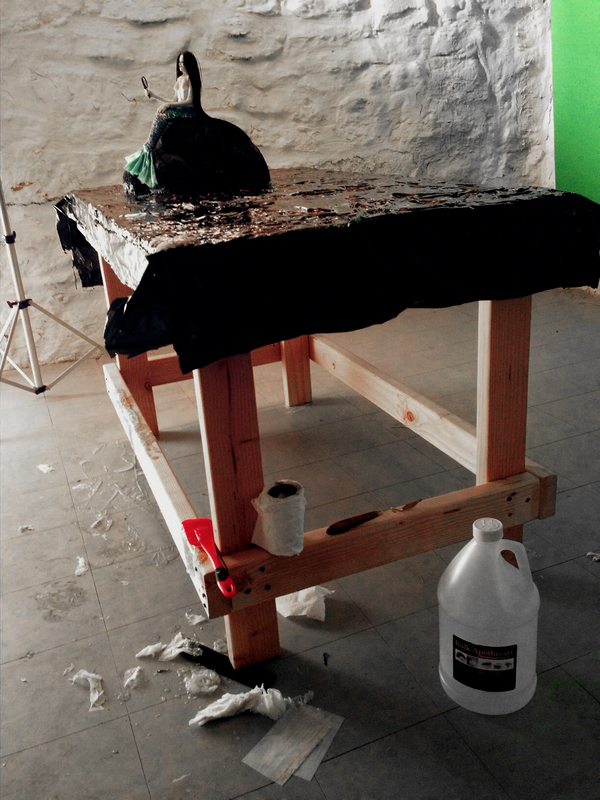 I poured eight bottles of the stuff over the black plastic covering the animation table and was very quickly overwhelmed with its strong odor. To make matters worse, I hadn’t thought about how to make the sea foam in advance and got the “bright” idea to use baking soda. It looked fine until it started to turn the gel into liquid. After shooting only 10 frames I started to feel very bad and had to open some windows and get out of the basement. Once refreshed, I cleaned up the nasty hair gel mess and went online to order a gallon of fragrance free gel from Bulk Apothecary. It was worth the wait. The new gel worked wonderfully and had no smell. Plus I came up with a great idea for the sea foam. Toilet tissue! It’s sculptable once saturated with gel and not chemically reactive. Messy mermaid set. Hair Gel is spilling off of the table and bits of toilet tissue are spread all over. I’m using the red spatula to move the gel and the small pallet knife to sculpt the saturated toilet tissue. This post is patron supported. If you’d like to contribute to the production of Seed in the Sand by becoming a patron, please visit Patreon to learn more. We’re finally getting settled here in Kansas City. The meadow set is still in Oregon and I plan to work on finishing the meadow scenes next summer when I visit. Upon arriving at this house I had rented sight unseen based only on its location and a couple of photos, I was delighted to find a spacious basement! The house description only mentioned laundry hookups in an unfinished basement, so I didn’t know what to expect. The garage I had been planning to use as my animation studio is very small and subject to temperature extremes and I’ve heard that the hail gets pretty big around here so keeping my car in the garage seems like a better use of that space. 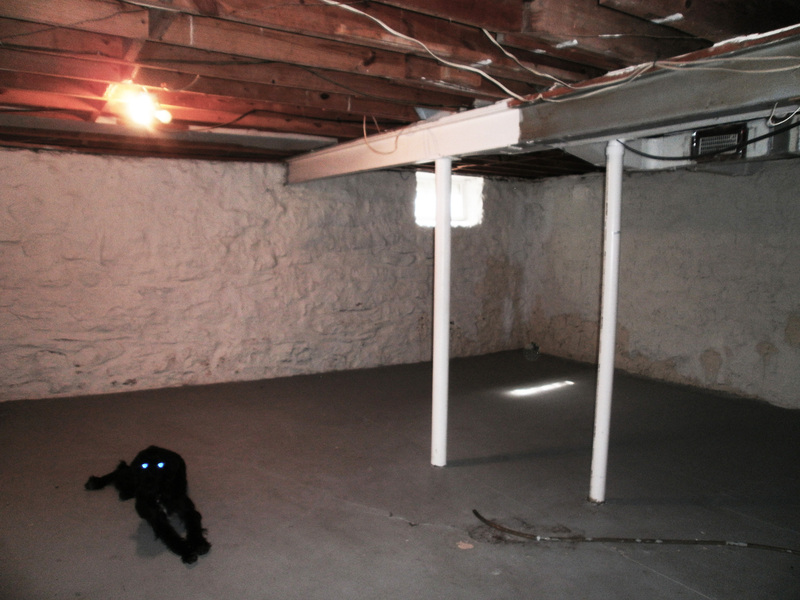 I’ve documented my steps to preparing the basement for shooting the dancing doll dream scenes. 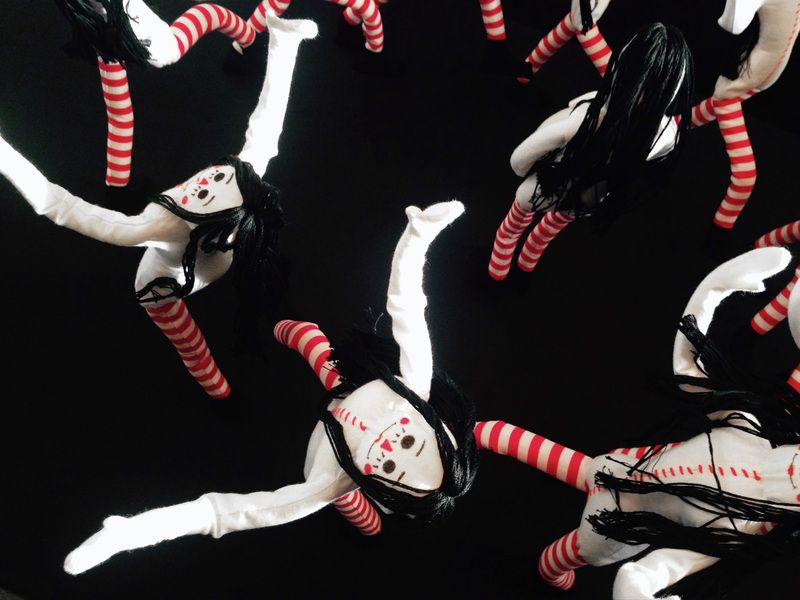 They will be dancing in a blank black space so the set is very simple. 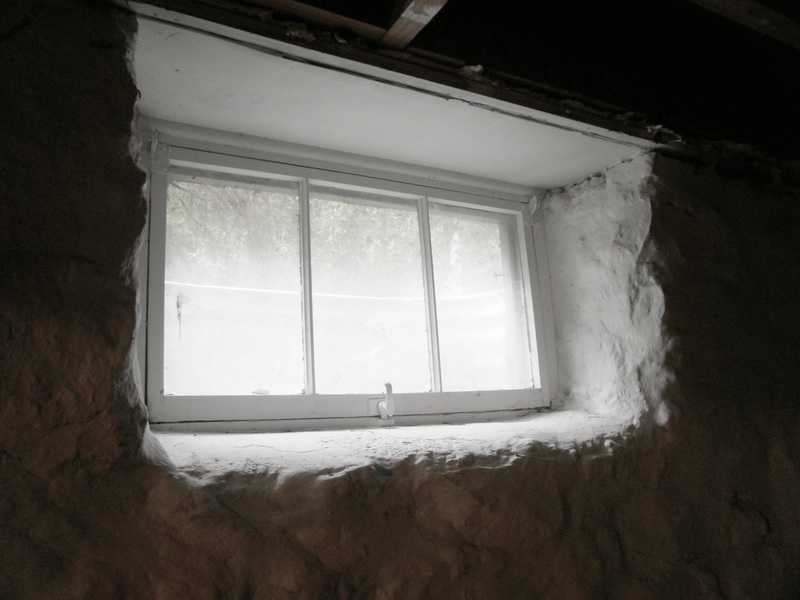 To get the space ready, I needed to build an animation table and cover four basement windows with duvetyne curtains. This is the corner of the basement I’ll be using for animation. My familiar shadow is staring back at me. The basement is large, but the ceilings are not as high as I am used to. My first thought was to build a table that measured four feet by four feet, but I realized I didn’t need a table that big for this scene and decided to build two smaller tables so that I can use one for animation and have a second to use as a workbench until it is needed for expanding the animation space. 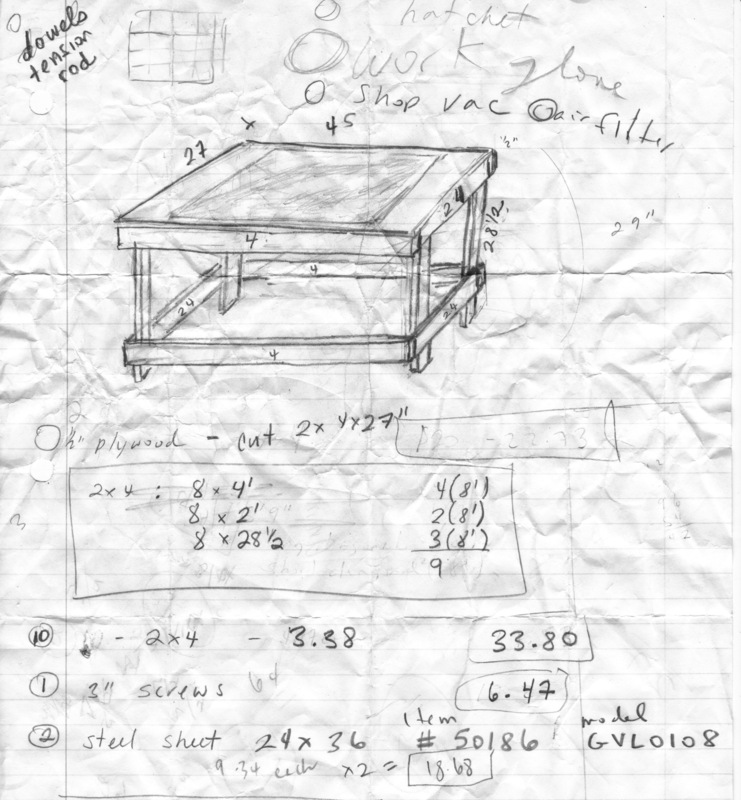 My first step was to draw a plan for the table and make a list of supplies. You see that I have listed the prices of some of the supplies and the Lowes product code for the metal sheet. 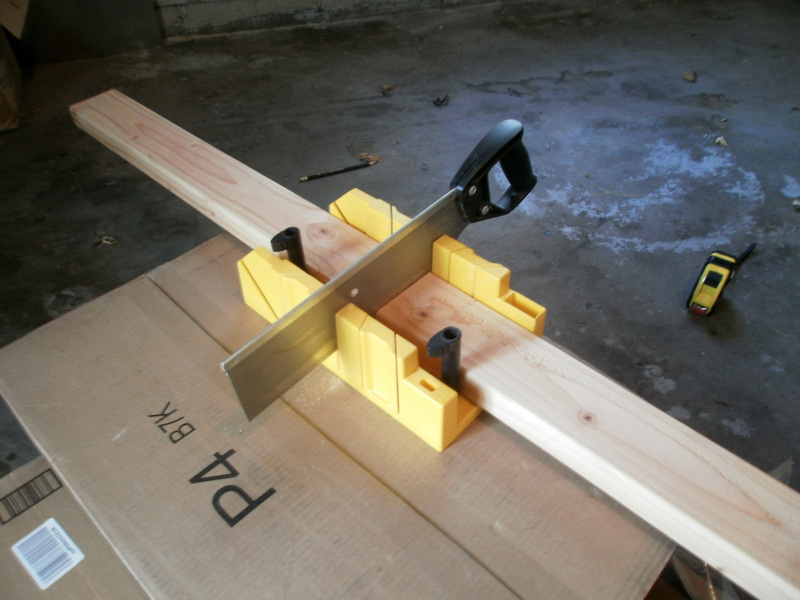 No workbench and no chop saw? No problem. I’ve got a big box and a miter saw. A little wobbly and slow, but it worked. 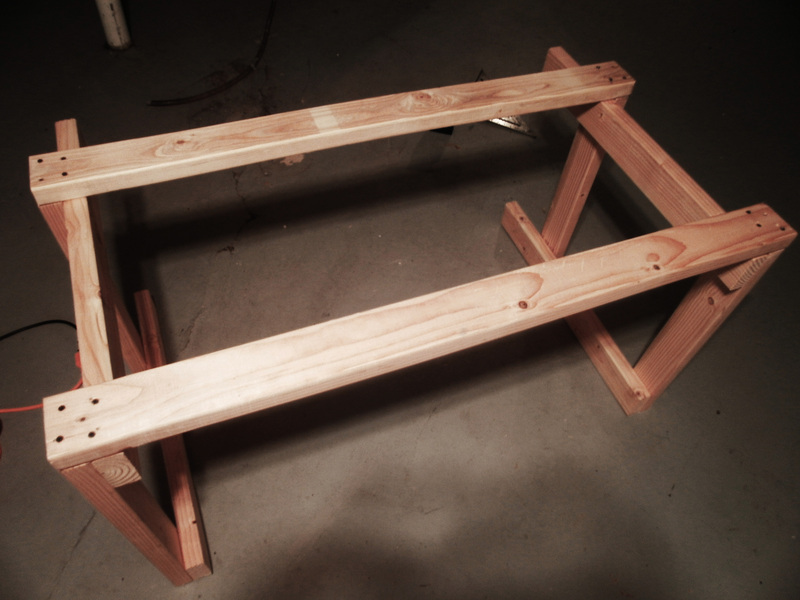 Who needs a workbench to build a workbench! I assembled the short sides of the table first. My shadow kept me company. Here is where it would have been handy to have a little help, but I managed to get the long sides attached to the short sides on my own and nearly square. Done! The table top is made with a 48″ x 27″ sheet of 19/32″ plywood. covered with two galvanized steel sheets that I found at Lowes. I prefer the metal sheet from Umpqua Sheet Metal that I used for the meadow set because it was much thicker. This sheeting is thin and flexible and will work okay, but may not be as stable as the other. It was easier to attach to the table though, because I could just nail it on. NOTE 12/30/14: These steel sheets are too thin! They don’t lay totally flat and they flex while animating. Moving one doll wiggles others! Also, I found an article explaining that magnetic attraction is weaker on thinner metal surfaces. That helps to explain why they are not standing as well as usual. 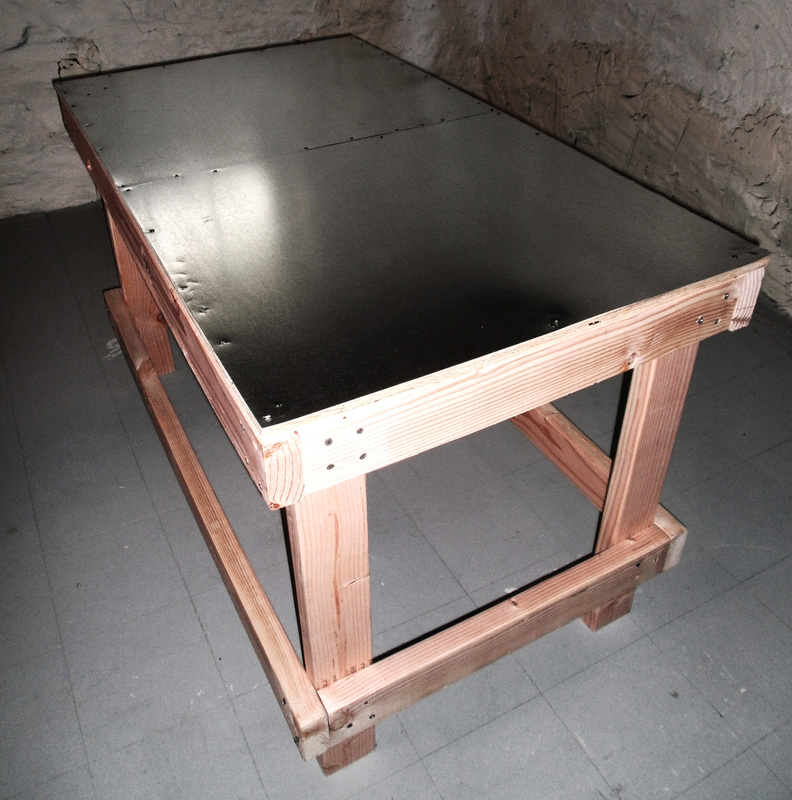 Here’s the article on Steel Thickness and Magnetism. I’ve made it through the first major dance scene on the thin sheets, wobbles and all, but will be replacing them with a thicker gauge stainless steel back splash I found at Lowes. The thicker metal will work much better. Once the table was complete, I turned my attention to blocking out the light. The basement had four windows to cover so I made curtains out of duvetyne, a very thick black fabric, and hung them with tension rods. My little corner of the basement is ready to go! The light blocking curtains are tucked into the rough stone windowsills and the animation table is covered in duvetyne fabric. The rest of the roll is hung as a back drop. 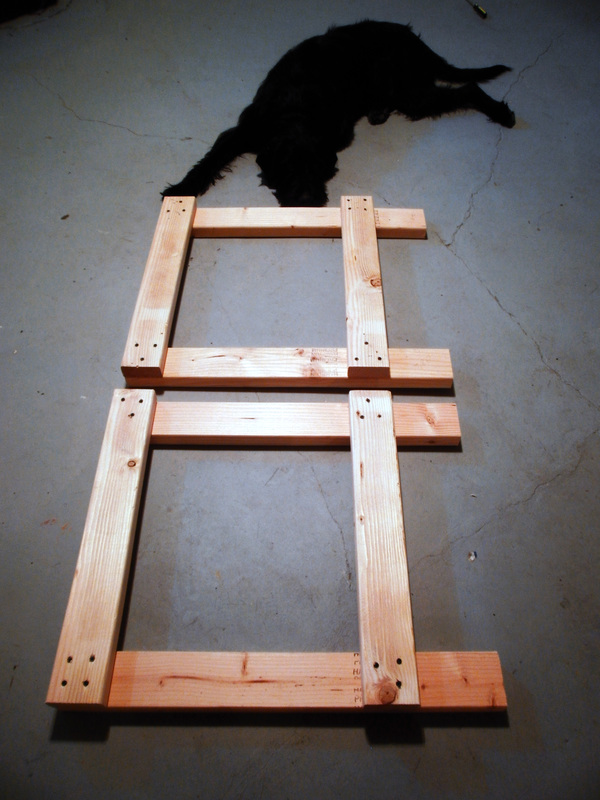 A shim is placed under the right front table leg to compensate for the uneven floor. 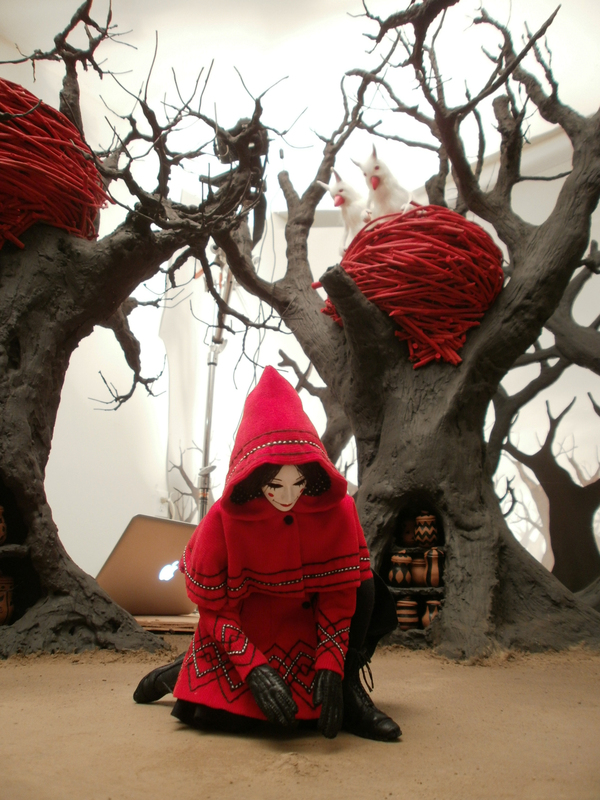 One of the doll puppets tests the table. The magnets in her feet hold securely to the metal sheet under the fabric. Next step: Lights! Camera! Action! 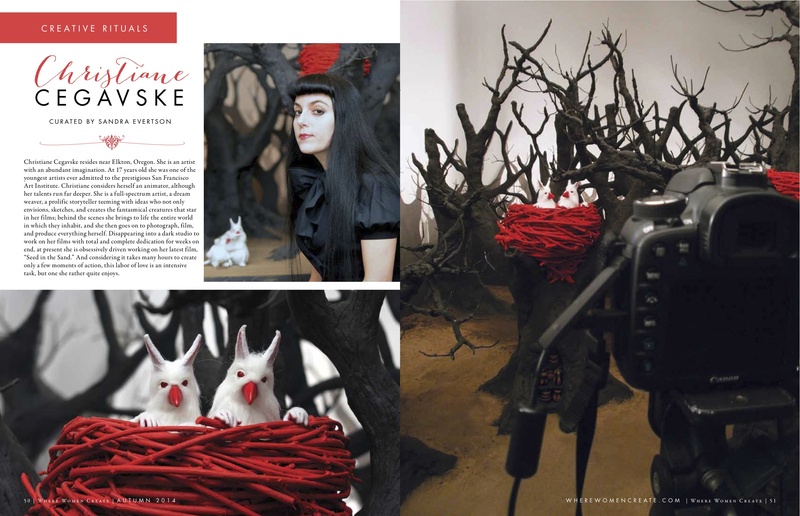 I’m in the Fall 2014 issue of Where Women Create! Get your copy to read the full article. The magazine is available to be purchased nationwide or online. The first two pages of the six page article. 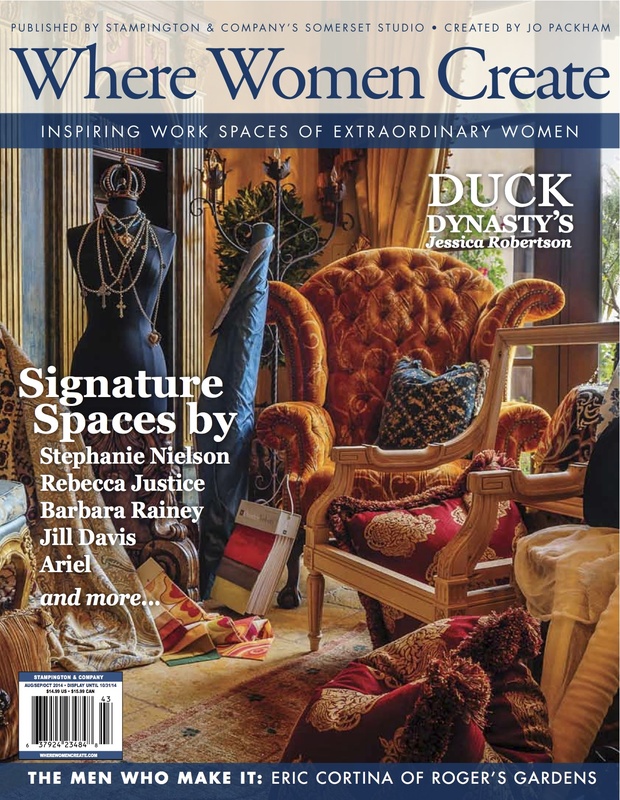 The front cover of the Fall 2014 issue. 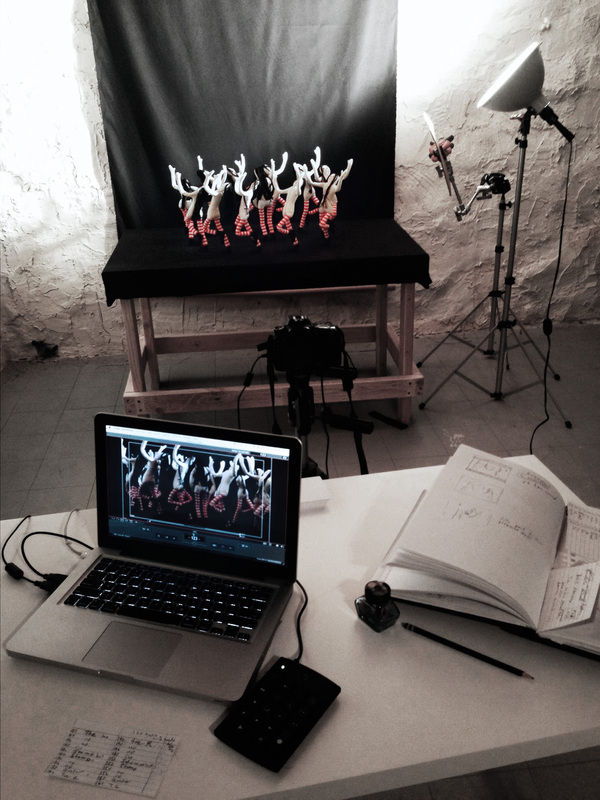 I’ve been hard at work in my studio animating the creatures dancing joyfully around the new sprout. 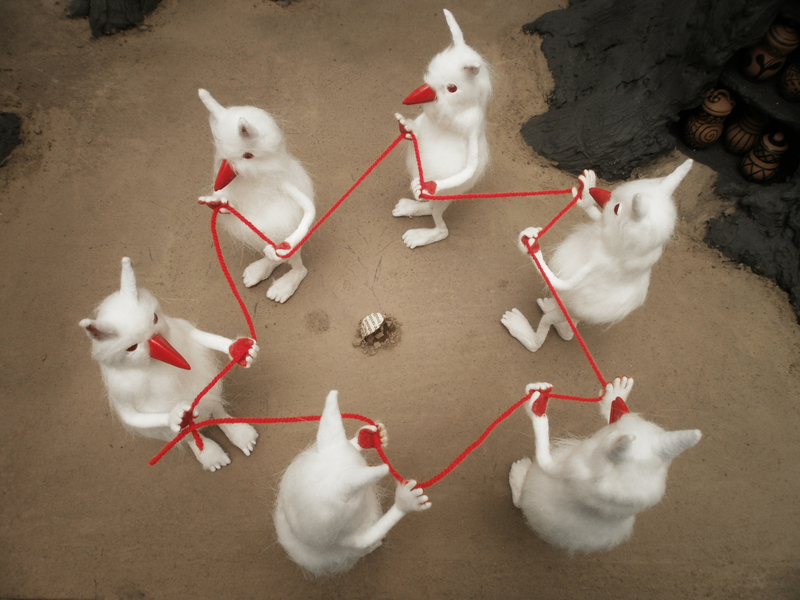 This very short clip from Seed in the Sand, and the pictures below, demonstrate my continued love of red string, extreme close-up and inexplicable ritual. Click on this picture to watch the clip on Vimeo. 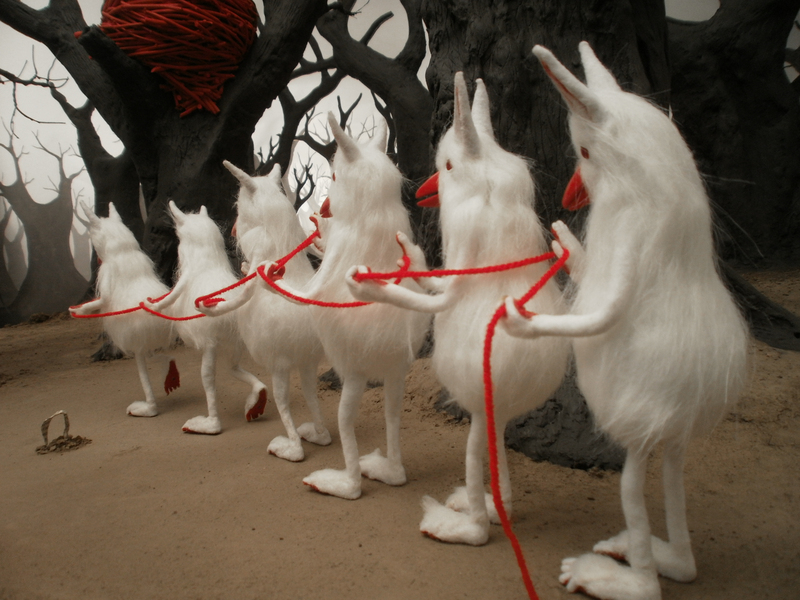 In this behind the scenes snapshot, the creatures are getting ready to dance. The filmed angle shows only a portion of this. They just looked so sweet lined up like this that I had to take a picture. I’ve been testing angles and ideas. 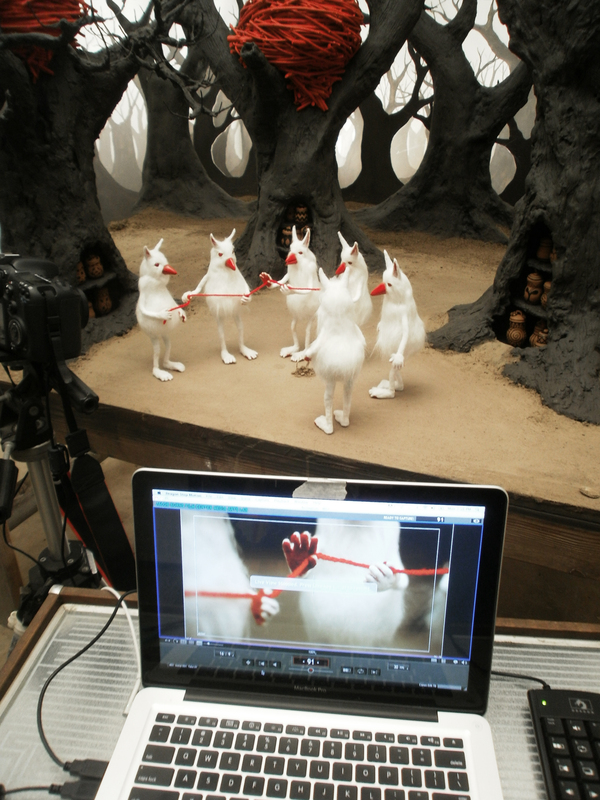 In this snapshot they are making a star of the red rope. I plan to shoot at an angle similar to this. I animated a focus pull using DragonFrame and my Canon 7D this weekend. It is the first time I have done this with this set up. It went very smoothly except at the end of the night when I tried to put my camera away. Knowing I would be touching the camera for every frame, I had tightened it to the tripod so tightly that I could not unscrew the bolt! I struggled with it for a long time before I finally got it loose. The focus pull clip is up on Vimeo. Check it out! Click on this picture to watch the video on Vimeo. The character animation is shot on twos, meaning that two frames are taken of each move, and the focus pull is shot on ones, meaning that there is a move on every frame taken. Shooting the focus pull on ones makes is very smooth. This character has just woken from a dream of dolls dancing to see that the seed has sprouted. Two of the shots with the new puppet required a camera position that was not possible to achieve with my tripod. 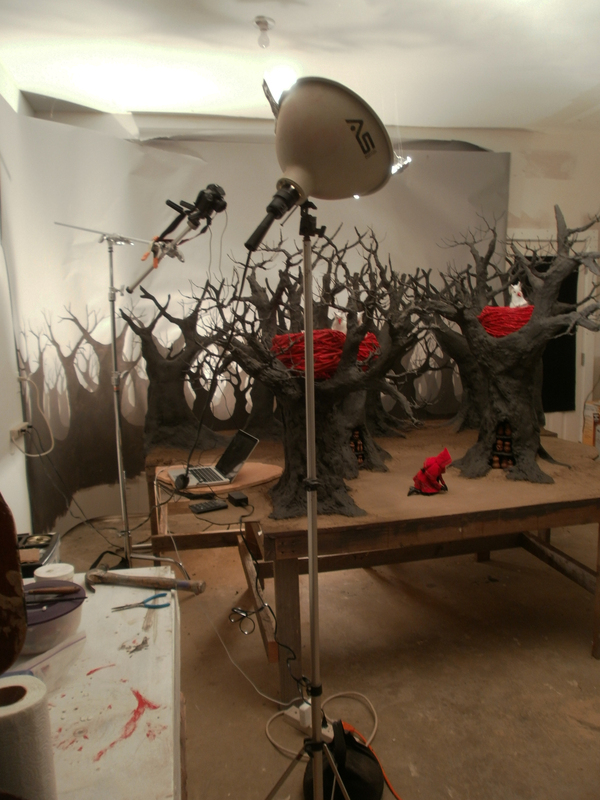 The goal was to get the camera up very high above the set to see the ground from the perspective of the creatures in the nest. A still image from the opening scene in Seed in the Sand. To get the required angle, I made a camera rig using the center portion of my tripod attached to a c-stand. The center portion of the tripod has been separated from the legs and attached to a c-stand. Here is the entire set-up. See the camera high above the set angled downward. My computer had to rest directly on the set due to the limited length of the cables connecting it to the camera. 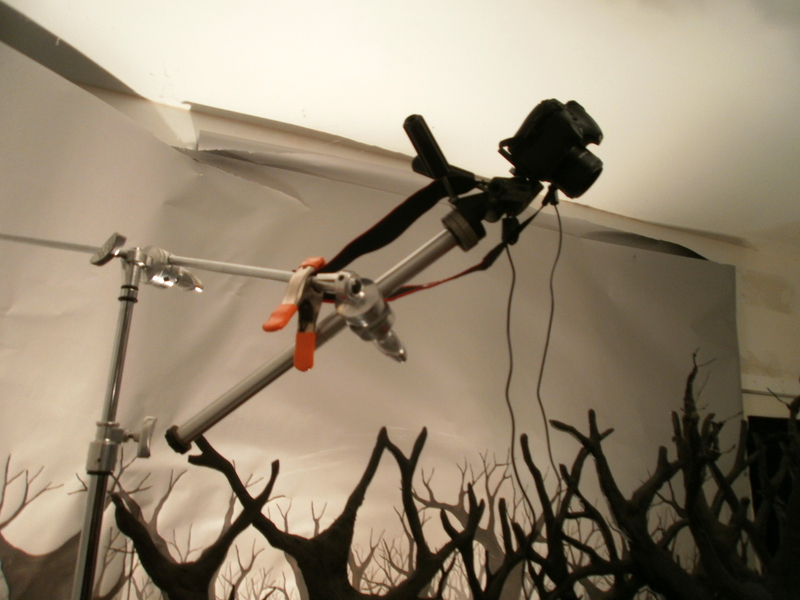 At ground level you can see the camera up there behind the branches and the computer on the set.